“Virtue signaling” is by no means an old phrase. However, the practice has been around for a very long time. Virtue signaling is a public assertion of a moral or allegedly moral opinion in order to make one seem good and acceptable to a particular in-group they desire to identify with. I saw this once in a conference I attended years ago in which church-planters were seeking to raise support. I myself was one of them. The conference was held at a Bible College that, at the time, I knew only certain things about. It had been recommended to me by a reasonable source, so I went. In retrospect, I don’t think I would do it over again. In concept, it really is a neat thing, people raising support for church-planters in that way. If it can be done right it can really be a blessing. We were able to raise money to purchase material for the rental space where our church started. So, the problem is not necessarily the idea of conferences like these. The problem is more with specific individuals’ intentions. Apparently, the school where the conference was held was known for its militancy regarding a particular doctrine. Let’s just say that if you were in favor of “Closed Communion”, or if you made reference to “the Church” while doing air-quotes and saying “whatever that is”, you were a guaranteed hit with the crowd. These “buzz phrases” were all succinct ways of publicly asserting, “I’m one of you. I’m a good guy”. But more, “I’m an outspoken one of you and I’m willing to go head-to-head with anyone who isn’t like ‘us’”. This subtle signaling of virtue ingratiated one with that particular crowd. There were several church-planters who did this. They raised astronomical amounts of money. I’m not suggesting their virtue signaling was the only reason they did, but it certainly may have been a factor. The man who raised the highest amount was an outrageously excitable guy, said all the buzz phrases in rapid-fire fashion like a machine gun, and practically jumped out of his suit doing it. The other two were a bit more composed but they still hit all the key talking points. To be clear, much of what they purported to believe was good! But, that’s not the point. And my point is not to criticize a school or its doctrine. The point of this article is they were virtue-signaling in order to win over a crowd they wanted to be in with. I’m not suggesting they didn’t believe what they were proclaiming, or that they lied. I just didn’t feel so good about the idea of the whole thing. I still don’t know all the reasons why. I’ve since been reminded of Matthew 6:1-4. Were these men “sound[ing] a trumpet…?” I don’t know if for those men at the conference that shoe fits. It’s just what it reminded me of. “Let another man praise thee, and not thine own mouth; a stranger, and not thine own lips”? I don’t know. For me, I’d much rather be asked questions about what I believe and then answer them honestly. In such a setting, men are left to read the crowd to try to discern what they want to hear and then say those things with as much enthusiasm he can muster. If you don’t, well, tough. You look like a schlub. How does one apply that in the context of raising support? I’m not sure. Perhaps that’s why I often felt so strange about it. I’m grateful for it, but the process of raising it seemed to cut against the grain of the new nature a little. Perhaps there is an unspoken consensual relationship in such cases in which the candidate consents to speak good about himself in a way he normally wouldn’t, and the listener's consent to listen to him without seeing it as shameless self-promotion. Who knows? It’s a weird thing. I guess this even means that saying “amen” in church for the wrong reasons can be a form of virtue signaling if it’s done to ingratiate one's self to the preacher. I know I’ve seen that one before. I’ve likely even done it. I remember once hearing people wildly amen-ing when the preacher railed on things “out there” but dead silence when he brought down conviction “in here”. I guess only the Lord knows why we do the things we do. It just seems that we’re wired to want to align ourselves with those who we see as the “prominent” or those who we think will bring us some kind of intrinsic value. Virtue signaling then becomes the way we do it and it’s just doesn’t seem like a good thing. Yet it seems like at times we need to make it known that we are not with a certain group or faction. That may be a good thing. So perhaps virtue signaling itself is a normal part of communication and it’s the motive and method that make it either good or bad. 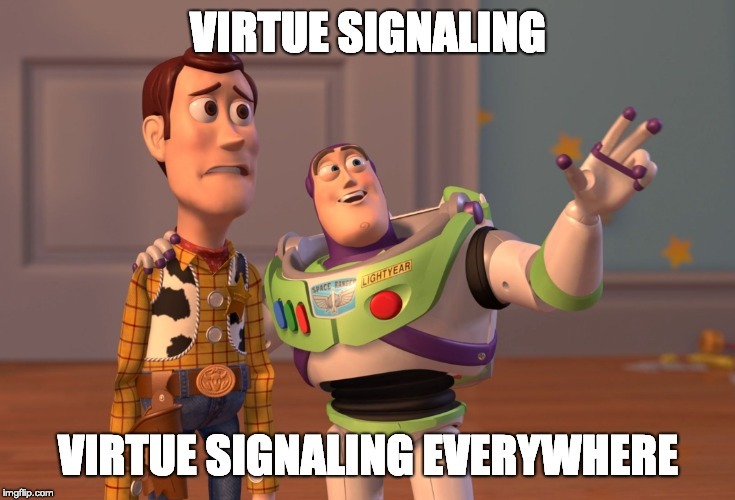 It seems the alternative to virtue signaling would mean that you stand for nothing. All of this makes me wonder about myself? Do I subtly participate in “Christian virtue signaling”? It seems so easy to do and so normal. I can think of ways that I do it, but are they good ways? How about you? In what other ways have you observed this phenomenon?